Later this month, the 2016 auto show season will kick off with the Paris Motor Show. To celebrate the occasion, Mercedes-Benz will be revealing its newest high-performance AMG model. Daimler has already released photos of the 2017 Mercedes-AMG GLC43 coupe, but Paris Motor Show guests will be the first members of the general public to see the vehicle in person. Visual highlights of the coupe include its chrome-tipped diamond-block radiator grille, chrome-plated quad design tailpipes, and 20-inch AMG multispoke light-alloy wheels. The inside of the coupe promises to be just as eye-catching as the outside. Designers went with a black and red color combination, which will be complemented by longitudinal-grain aluminum trim. In addition, the driver will have access to an Audio 20 infotainment system that features two USB ports and Bluetooth hands-free capabilities. The most impressive part of the new GLC43 may be its powerful drivetrain. Equipped with a 3.0-liter biturbo V6 engine and nine-speed automatic transmission, this coupe is good for 362 horsepower and 384 lb-ft of torque. Mercedes has limited the top speed of the GLC43 to just 130 mph, but it still can rocket from 0 to 60 mph in a mere 4.8 seconds. 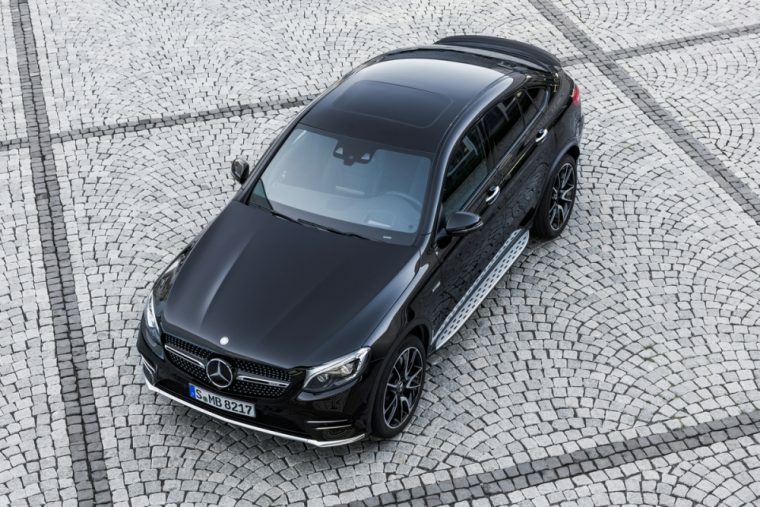 Moreover, to better utilize all of that power, Mercedes has equipped the GLC43 with a specialized suspension system that it calls Air Body Control, as well as AMG Performance 4MATIC all-wheel drive with rear-biased torque distribution. The 2017 Mercedes-AMG GLC43 coupe is scheduled to reach US dealerships during the first quarter of 2017.